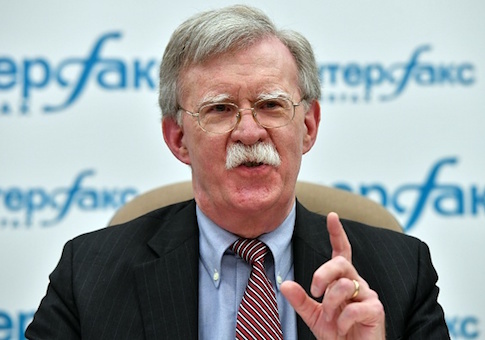 Embattled Venezuelan President Nicolas Maduro and his advisers should flee the country while amnesty is an option and retire to a faraway beach, U.S national security adviser John Bolton tweeted on Thursday. The United States, along with the European Union, Canada and every Lima Group Latin American country but Mexico have recognized Juan Guaidó, the leader of the National Assembly, as the country's legitimate, interim president. Maduro was sworn in for a second term earlier this month, but his election is widely viewed as rigged and illegitimate, and his international supporters include human rights abusers like China, Cuba, and Russia. The Trump administration has offered its support to Guaidó and imposed sanctions on Venezeula's state-owned oil company to further squeeze Maduro and his top cronies. Vice President Mike Pence called Maduro a "dictator" last week and urged Venezuelans last week to rally around Guaidó. Guaidó has declared himself acting president and called on the military to withdraw its support for Maduro, an authoritarian whose regime has brought economic ruin to the country. Venezuela's economy has collapsed and millions have fled the socialist regime that's brought about hyperinflation, rising prices, and food and medicine shortages. Maduro's government has brutally cracked down on protesters. Guaidó told CNN through an interpreter he wouldn't rule out accepting U.S. military support if necessary to end Maduro's reign but said he hoped it wouldn't come to that. "Here in Venezuela we are doing everything we can to put pressure, so that we don't have to come to a scenario that no one would wish to have," Guaidó said. "We are trying to restore the sovereignty of this country, to restore the liberty and democracy of Venezuela." This entry was posted in Politics and tagged John Bolton, Nicolas Maduro, Trump Administration, Venezuela. Bookmark the permalink.